(Orlando, FL) The It Gets Better Project, Whisper and the Orlando Police Department (OPD) are kicking off their LGBT community outreach by releasing an It Gets Better video featuring Orlando Police Lieutenant James Young. Lt. Young has been with OPD for nearly 20 years and was appointed by Chief John Mina to uphold the department’s promise to serve everyone with dignity and respect as the agency’s LGBT Police/Community Liaison. After the Pulse Nightclub tragedy in June, the It Gets Better Project partnered with Whisper and asked Whisper users to send their messages of hope and support to the victims. Thousands of responses were received from around the world. Together, It Gets Better and Whisper translated the best responses into postcards and posters — all different colors of the rainbow to share with the people who have been most affected by the tragedy. 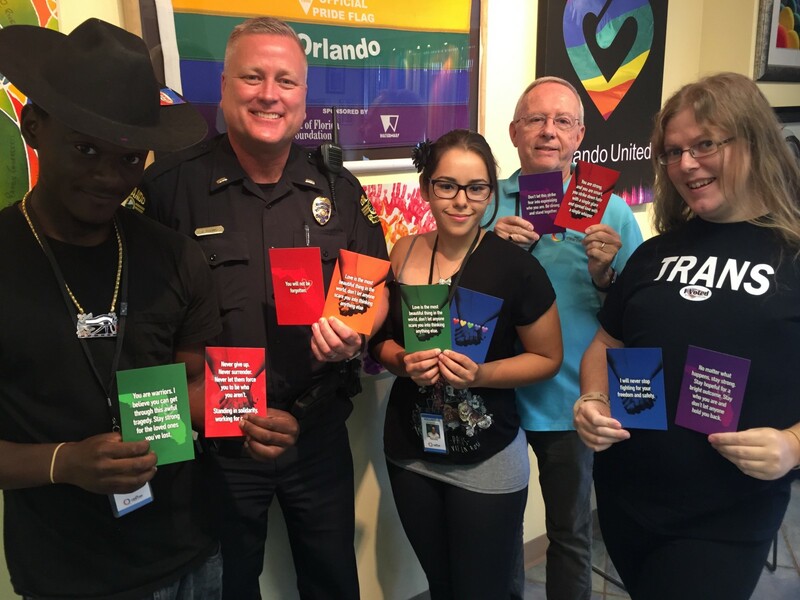 The Orlando Police Department and the City of Orlando have disseminated these postcards to the Orlando LGBT Center and the Pulse Nightclub site and will continue to during the Orlando Pride festival on November 12th and beyond. A poster has also been sent to the City of Orlando to be featured in a permanent memorial that is being created in honor of the 49 we have lost. Launched by syndicated columnist Dan Savage and his partner Terry Miller, the It Gets Better Project is a 501©3 nonprofit organization that leverages the power of media to reach and provide critical support and hope to LGBTQ young people around the world. Through collaborative partnerships elevating positive portrayals of the LGBTQ community, the It Gets Better Project strives to communicate to LGBTQ youth that it gets better — and inspire the changes necessary to make it better for them. The It Gets Better Project received the 2012 Governor’s Award from the Academy of Television Arts and Sciences and has garnered support from President Obama and 500,000 others who have taken the pledge to share messages of hope and to speak up against intolerance. OPD is a nationally recognized law enforcement agency that is focused on the safety of Orlando’s residents, visitors and businesses. The City of Orlando and the Orlando Police Department are committed to making sure that all members of the community are represented and have the same access to services. OPD is among the first law enforcement agencies in the country to appoint an LGBT Police/Community Liaison to uphold the department’s promise to serve everyone with dignity and respect. Whisper is a leading media company based in Venice, California. Whisper’s mobile app is the largest online platform where people share real thoughts and feelings, forge relationships and engage in conversations on an endless variety of topics — without identities or profiles. Whisper content and stories reach hundreds of millions of people each month across platforms. Whisper is spearheading a movement that believes that happiness starts with being your real self. Whisper is backed by venture investors including Sequoia Capital, Lightspeed Venture Partners, Thrive Capital, Shasta Ventures, Trinity Capital, and CAA Ventures. Whisper is available on iOS and Android. Our mission is to communicate to LGBTQ youth around the world that it gets better, and to create and inspire the change needed to make it better for them.